Goethe University’s Museum Giersch shows pictures of a nearly forgotten artist couple. 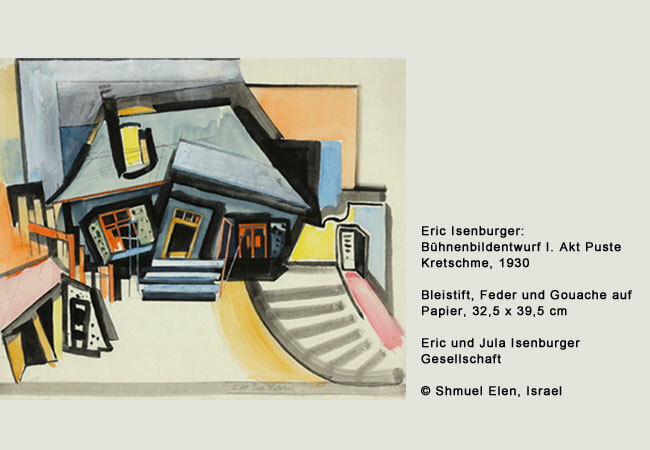 The visual artist Eric Isenburger (1902–1994) and his wife and muse, expressionist dancer Jula Isenburger, née Elenbogen (1908–2000), are among the 20th century’s almost completely forgotten artist personalities. Now, for the first time, the Museum Giersch der Goethe-Universität is dedicating a comprehensive retrospective exhibition in Eric’s native city. Eric Isenburger’s training at Frankfurt’s Kunstgewerbeschule was followed by numerous study trips and a longer stay in Barcelona. Together with his wife, he initially lived in Vienna and subsequently in Berlin as an independent artist and stage designer. As Jews, the couple were subject to repressive measures by the National Socialist dictatorship as early as 1933, and began the Odyssey of their flight: Paris, Stockholm, Southern France and the French internment camps Les Milles and Camp de Gurs were stations in the years that followed, until in 1941 they finally obtained a visa for the USA and were able to leave Europe via Lisbon to New York, where they lived for the rest of their lives. Despite these conditions, some of which were extremely difficult, Eric Isenburger created an original artistic oeuvre comprising portraits, landscapes and still lifes. With a late-Impressionist stamp, in part expressive style and in terms of material technique an experimental posture, Isenburger the painter took the outer world as his point of departure, but refrained from all-too obvious commentary on his times. His extraordinary oeuvre is truly a discovery.